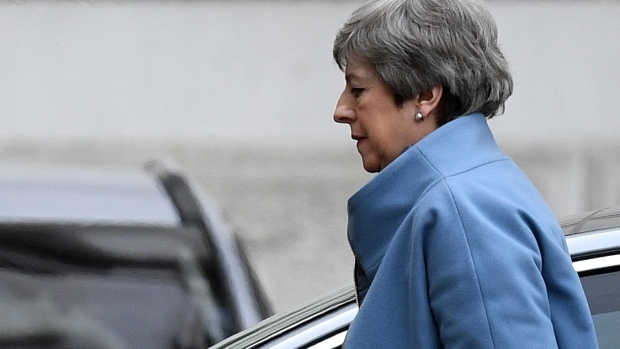 Theresa May gambled on a desperate bid to get her Brexit deal approved by Parliament, as a standoff with the European Union drove Britain to the brink of an economically disastrous no-deal divorce. The premier heads to the European Council meeting in Brussels on Thursday to push a demand her EU counterparts have already said she can’t have until she persuades the U.K. Parliament to support the Brexit deal they struck with her: a one-off, three-month delay to Britain’s departure. 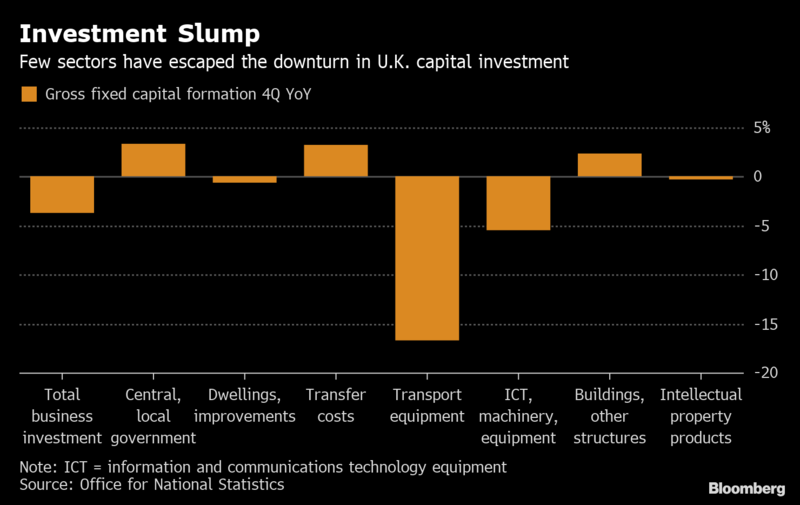 The deadlock over how long to delay the U.K.’s exit from the EU plunges the country deeper into a political crisis that now seems likely to push the Brexit endgame into the final hours before next week’s deadline. Jeremy Corbyn, leader of the opposition Labour Party, was also slated to travel to Brussels on Thursday to make the case for an alternative to May’s withdrawal plan. Under pressure from euroskeptic Conservatives, the prime minister formally proposed delaying Britain’s exit from the EU until June 30. But the bloc warned if she can’t persuade members of Parliament to vote for her deal in the next nine days, the choice will be a prolonged extension or leaving without a deal. In a address to the nation from her 10 Downing Street office on Wednesday, May hinted she could even resign rather than agree to a lengthy postponement that would keep the U.K. in the bloc beyond the middle of the year. European Council President Donald Tusk said such a short Brexit extension would only be possible if Parliament agrees to enact the existing divorce deal -- which it’s twice overwhelmingly rejected -- by the existing exit day of March 29, giving May just over a week to convince members of Parliament to change their minds and vote for her plan. Early signs are that May has repelled MPs she needs to convince. Lisa Nandy, a Labour lawmaker who has previously suggested she could be won over, told ITV’s " Peston" show that "there is absolutely no chance" May will win support after Wednesday’s statement. And Tory rank-and-file lawmaker Phillip Lee told the same show that May’s approach had "backfired." The EU has already penciled in an emergency summit for next week when it could propose a long extension to the negotiations, but with conditions attached, potentially including ripping up May’s proposal, calling a British election and even a second referendum. Despite the warnings from Brussels, EU officials said averting a calamitous no-deal split is now the priority. The bloc is very unlikely to push the U.K. out on March 29 with no safety net because a chaotic exit would damage them too, the officials said. May appeared to have ignored advice from European Commission President Jean-Claude Juncker in making her decision. He told the prime minister in a telephone call on Wednesday morning that the latest end-date for a short extension was May 23, when EU Parliament elections start, according to his spokeswoman, Mina Andreeva. EU ambassadors in Brussels discussed on Wednesday what the conclusions of Thursday’s summit on Brexit should say, according to a person familiar with the matter. The envoys agreed that the statement will be friendly but tough, the person said, asking not to be named. EU leaders are likely to be asked to agree the wording of the summit conclusions themselves instead of having a draft prepared by aides in advance. That means it’s likely to be a long night, the person said. In Parliament on Wednesday, May was accused of reneging on pledges she and her ministers made a week ago. Then, in order to help win crucial votes in Parliament, the government indicated that if the House of Commons hadn’t approved her Brexit deal by now, she’d request a longer extension. One of the most excoriating critiques during a debate forced by the opposition Labour Party came from the normally mild-mannered former Attorney General Dominic Grieve, a member of her own Conservative Party. He accused her government of "fast running out" of integrity and said May’s question-and-answer session in Parliament on Wednesday "was the worst moment" in his 22 years as an MP. "I have never felt more shame to be a member of the Conservative Party or to be asked to lend her support," Grieve said. "She spent most of her time castigating the House for its misconduct. At no stage did she pause to consider whether in fact it is the way she is leading this government which might be contributing to this situation." Before her address to the nation, May met with opposition leaders, including those of the Scottish National Party, the Welsh party Plaid Cymru, and the Liberal Democrats. But main opposition Labour Party Leader Jeremy Corbyn walked out apparently in protest at the presence of Chuka Umunna, who quit Labour last month and now speaks for an 11-strong group of former Labour and Conservative lawmakers. Those who did attend said the premier showed no sign of budging. “She remains astonishingly intransigent, and continues to try to bully MPs into a choice between her deal or no deal,” said Liz Saville Roberts, Westminster leader of Plaid Cymru. Corbyn later held a 20-minute call with the premier, after which he said "she is in complete denial about the scale of the crisis we are facing and unable to offer the leadership the country needs." He called her approach "unacceptable and reckless." Foreign Secretary Jeremy Hunt hinted during an interview on Thursday the prime minister is feeling the strain. The government has promised MPs it will put forward a motion in the House of Commons on Monday, which they can use to explore different models of Brexit, and a government official indicated a third vote on the Brexit deal may be held on Tuesday or Wednesday next week.